Is NuVal the Future of Nutritional Scoring? Personally, I find comfort in simplicity. Unfortunately, the grocery store is one place I don’t find this comfort too often. Why can’t there be an easier way to determine a healthy product other than analyzing and interpreting the nutrition fact label and ingredient list? It seems as though every product has some nutrition claim: “whole grain”, “9 essential vitamins and minerals”, “great source of calcium”, the list goes on and on. However, these claims can be misleading, confusing, and even in some instances downright false, which can lead to more questions than answers. How can one balance the nutritional benefits of one product against another? Enter the NuVal system. JUST WHAT IS THE NUVAL SYSTEM? 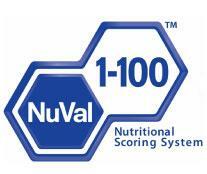 The NuVal System is a nutritional scoring system that scores the overall nutritional value of individual food items from 1-100, the higher the score the better. Since its development, it has been endorsed by the American College of Preventative Medicine (ACPM), used by large food chains such as Meijer, HyVee, and Price Chopper, and it will soon be implemented into a school district in Missouri. So how does on come up with a scoring system of 1-100? With an algorithm know as the Overall Nutritional Quality Index (ONQI), that converts nutritional data into a single numerical score. Led by Dr. Katz of Yale University, the formula was developed by an independent team of leading nutrition and medical experts from several universities and health organizations over several years. The formula incorporates more than 30 nutrients to determine a final score. Some of these nutrients include carbohydrates, protein, fat, fiber, vitamins, minerals, and antioxidants. Some specific nutrients that generally reflect a higher score include folate, vitamins A, C, D, and E, and potassium while other foods that are higher in saturated fat, trans fat, sodium, sugar, and cholesterol tend to reflect a lower score. But don’t worry, the ONQI is the only complicated and intricate aspect of the system and luckily it’s only the resulting score you need to worry about and not the actual algorithm itself. While the scores don’t indicate whether a particular food is “healthy” or “unhealthy” the NuVal Scoring System can make it simpler and faster to shop at the grocery store by allowing you to better determine choices based on your nutritional needs. To find out more about products and stores using NuVal visit NuVal’s official website where you can even print a brochure to bring to your favorite store to suggest the use of NuVal near you. ← Is Alli Your Best Bet for Weight Loss?